You've found the best microwaveable heat pack and body warmer! Click the Buy Now button above to go to our online store and purchase the Bed&Body Warmer. Buy any three Bed&Body Warmers from our online store. We'll ship your order free, and we will send you a fourth Bed&Body Warmer, absolutely free. No coupon code needed. Buy three, we'll do the rest. We will send you the same cover style and model you already ordered, or a similar style. To request a particular style, list its name in the Order Comments on the checkout page. All four Bed&Body Warmers must be shipped to the same address. 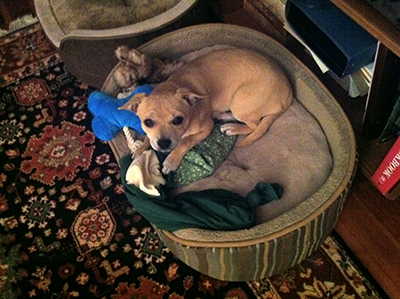 You must order three complete Bed&Body Warmers, not inner bags only or replacement pieces. Offer applies only to Bed&Body Warmers, not Boot Dragon boot warmers or Foossage massagers. You can give it to your mom, give it to a friend, or give it to a total stranger. Share the warmth of AuntieA's Bed&Body Warmer with your friends and family. We call it "Three, Free, Free." This gift is on us! Click here to order. AuntieA’s™ Bed&Body® Warmer is an all-natural personal heating bag made with grains and spices. People use the Bed&Body Warmer to warm their bed, warm their feet, and ease their tense and sore muscles. Everyone loves a Bed&Body Warmer, especially Billy Bob. The Bed&Body Warmer has two parts: the inner bag and the outer bag. The inner bag is unbleached 100% cotton and contains grains and, in scented models, herbs or spices. The inner bag in the “Quilted” model is evenly divided into three baffles which hold the grain in place. The machine washable outer cover is 100% cotton flannel, giving the Bed&Body Warmer a warm and cozy feeling. The size of the Bed&Body Warmer is approximately 24 x 7 x 1 inches. The Bed&Body Warmer is heated in a microwave oven for two to four minutes, depending on the power of the microwave oven. The suggested time is for a 600 watt microwave oven. If your microwave oven has higher wattage, reduce the heating time by at least one minute. Be sure to test the Bed&Body Warmer for a comfortable temperature before using. Allow to cool before use if the Bed&Body Warmer is too hot. Tests show that the Bed&Body Warmer can maintain a temperature of 115°F to 125°F (the optimum therapeutic temperature range) for one hour or more. The Bed&Body Warmer is completely reusable. With proper care, the Bed&Body Warmer will last for years. The copyrighted Quilted model is evenly divided into three baffles to hold the grain, and the heat, exactly where you want it. 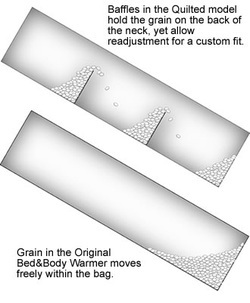 The unique design also allows you to move grain between baffles. The Original, unquilted model is available for those who prefer its flexibility and wide variety of uses. Bed&Body Warmers are available in either Scented or Natural (unscented). The Lavender scent recalls a calming summer garden. The Cinnamon/Nutmeg blend gives the Bed&Body Warmer an “apple pie” aroma. The Natural Bed&Body Warmer contains only grain. For people who are allergic to or dislike scents, we recommend the natural version. Customers tell us it smells like baking bread or rice pudding when the grain is heated. The Bed&Body Warmer is available in a variety of cover styles. Samples are shown on the Cover Styles page. Cover styles change regularly, so be sure to check the Cover Styles page for current availability. The cover is machine washable in cold water. Line dry. Do not wash the inner bag or get it wet.